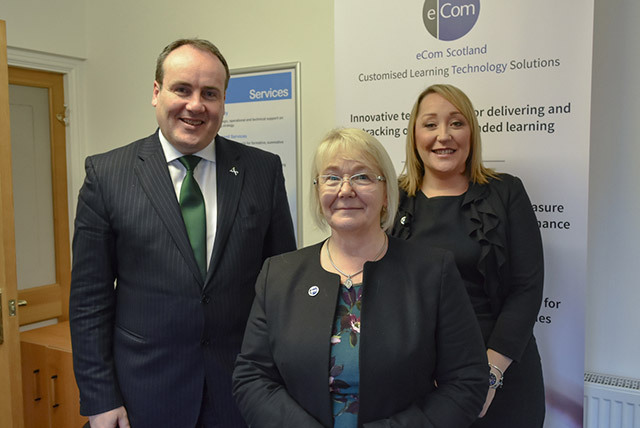 eCom Scotland was pleased to welcome Paul Wheelhouse, Scottish Government Minister for Business, Innovation and Energy, to its Fife offices today. The visit was an opportunity to show how Scottish organisations are using technology to positively impact skills development. eCom Scotland develops innovative technology solutions for workforce learning and development. They work with organisations across many sectors, including Energy. The company has achieved substantial growth in the last 3 years through a series of product launches and expansion into new markets. During the visit Mr Wheelhouse discussed the cultural changes required in businesses to successfully implement technology solutions. He viewed the skills management system which has enabled Scottish Water to track competency across their organisation, and the eLearning that Devro are using in their skills academy for their global workforce. He also learnt about the bespoke online assessment system that has helped IWCF (International Well Control Forum) to transform the examination and certification of their candidates worldwide. Wendy Edie, eCom Scotland’s Managing Director said “eCom has a strong culture of innovation, using the latest technology to find the right solution for each organisation. We support our clients throughout the life of their project so they can successfully embed the change and realise the most commercial benefit.